I confess sometimes when I see the needs around me, I feel overwhelmed. Friends ask me to pray for them, and I do, and my prayer list keeps growing. Sometimes, I don’t even know where or how to begin praying. Have you ever felt like that too? I’m not an expert on prayer, but I know when I talk to my Heavenly Father, things change. Sometimes it’s just my attitude or perspective that shifts. Sometimes, mountains of trouble shrink before my eyes. I just know prayer is important. Prayer was a vital part of Jesus’ life, and if He needed to stay connected to the Father, how very important it must be for us too! While praying for several friends going through the adoption process, this thought came to me: “A is for adoption. C is for cancer. F is for foster families.” I started thinking alphabetically through the issues and challenges facing our communities. Before long, I had an A to Z list focusing on topics from Adoption to Zero Prejudice and everything in between. I made 3×5 cards for each topic, adding names and organizations to pray for. Rather than feeling overwhelmed, I was excited at the possibility of organizing my prayer life this way. I realized this is a tool others might enjoy using too. The idea grew even bigger. “I wonder if I could get people to share their stories with us?” I thought. I asked friends, writers, counselors, and police officers if they might share their stories and advice on these various topics, and they all said yes! I’ve never been through adoption or been a single parent. But when others who’ve had those experiences share their stories with me, I understand better how to encourage and pray for people in those situations. Beginning today, the Pray A-Z series will post here every Monday and Thursday through the end of the year. I’m so excited to share these stories with you. You are going to love the writers, and their stories will open your eyes and hearts in powerful and meaningful ways. After all the stories have posted (around January 1, 2015), I will compile them in a PDF and make it available to you for free. My talented hubby designed these beautiful prayer cards, and they are available to download now here. When you click the link, you will be prompted to download the PDF file and save it to your computer. You can then print the cards, cut them out, and begin using them. I would love to have you join me in this journey of praying A-Z for our communities. Feel free to join in the conversation on social media using the hashtag #PrayAtoZ, and help spread the word. I’ll be tweeting, pinning, instagramming, and facebooking quotes and prayer prompts throughout the series. Let’s rally people to pray for our communities and the issues facing us all. Let’s ask God to breathe new life into our communities and show us how to love those who surround us every day. Remember to download your prayer cards here! Come back here Thursday for the first in the Pray A to Z series. We’ll be talking about Adoption and how we can pray for families and children throughout the adoption process and the organizations who serve them . 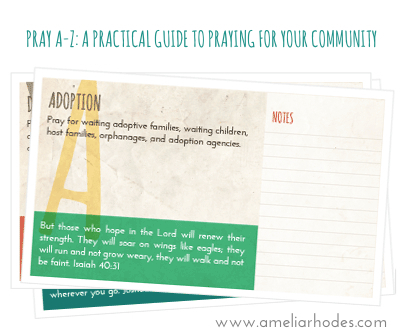 Get your free #PrayAtoZ prayer cards! Amelia – I opened my email today to look at the 1 Samuel devotions from Ada Bible and to my surprise I found Praying from A-Z. I wanted to take a look because my ladies small group is studying prayer. What a great idea! Thanks for your creativity and for sharing this great idea with us. Thanks also to your talented hubby for making the prayer cards. Thank you so much, Chris! It’s definitely been a team effort, and I am excited to see how God might use this to bring people to Him!! I love this idea! I love this idea! I love this idea! I love, love, love that you love it, Amy! Amelia – This is so awesome! I’m sharing now!! I really love this idea and can’t wait to follow along. Thanks for joining us Lisa!! I’m excited to start this! Can’t wait to start this endeavor. Love the A-Z cards. Ellen, I’m so glad you will be joining us!! I’m so glad you did this–I can’t wait to start my set. Also, I hope you keep praying for the “A” in our family even though we’ve moved away. We will always need prayer in that department! Jenna, I am absolutely praying for the A in your family. I’ve added you to my card! It’s so funny, I was just thinking today while I was driving back from taking the kids to school that I’m feeling over-whelmed by all the prayer requests and fear that I’m forgetting someone/something! I prayed at that moment for help with this, and then here is this email. God is so good!!!!! Rachel, how exciting!! Thank you SO MUCH for sharing, and for letting me know how God is using this to encourage your friend! !